Thank you very much, Anhanguera and Cleiber, for the right identification of this female of a Blue Dacnis or Turquoise Honeycreeper (Dacnis cayana). This bird was photographed in Brasília, Brazil. 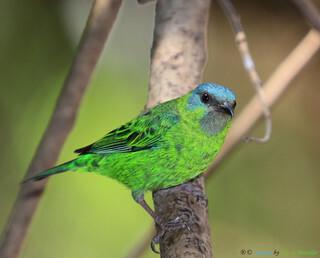 The Blue Dacnis or Turquoise Honeycreeper, Dacnis cayana, is a small passerine bird. This member of the tanager family is a resident breeder from Nicaragua to Panama, on Trinidad, and in South America south to Bolivia and northern Argentina. It occurs in forests and other woodlands. The bulky cup nest is built in a tree and the normal clutch is brown-blotched white two eggs. The female incubates the eggs, but is fed by the male. The Blue Dacnis is 12.7 cm long and weighs 13 g. It has a relatively short bill compared to other honeycreepers. The adult male is turquoise blue with a black forehead, throat and back. The wings and tail are black edged with turquoise. The female and immature are mainly green with a blue head, paler green underparts and green-edged brown wings. These are social birds which eat mainly insects gleaned from foliage, flowers or bromeliads. Fruit is often taken and usually swallowed whole, but nectar is rarely consumed. The Blue Dacnis’s call is a fruit thin tsip. * ffrench, Richard (1991). A Guide to the Birds of Trinidad and Tobago, 2nd edition, Comstock Publishing. ISBN 0-8014-9792-2. * Hilty, Steven L (2003). Birds of Venezuela. London: Christopher Helm. ISBN 0-7136-6418-5. Muito obrigado ao Anhanguera e ao Cleiber pela correta identificação desta fêmea de Saí-azul (Dacnis cayana). Este pássaro foi fotografado em Brasília, Brasil. Características: 13,0cm de comprimento, 16g.Relativamente pouco dependente de flores.Seu canto é um gorjear fraco.